Ah, the architecture of this world. 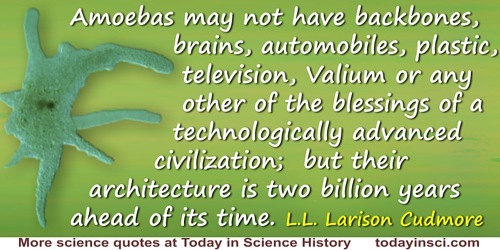 Amoebas may not have backbones, brains, automobiles, plastic, television, Valium or any other of the blessings of a technologically advanced civilization; but their architecture is two billion years ahead of its time. In The Center of Life: A Natural History of the Cell (1977), 15-16. Particle Physics and an Introduction to Field Theory (1981), 177. The study of human anatomy is the basis of the investigation of the anatomy of all animals with a back-bone; and conversely, the anatomy of any animal of this class tends to throw light on that of man. In 'Report of the Secretary', Seventh Annual Report of the Board of Regents of the Smithsonian Institution for 1852 (1853), 16. When ever we turn in these days of iron, steam and electricity we find that Mathematics has been the pioneer. 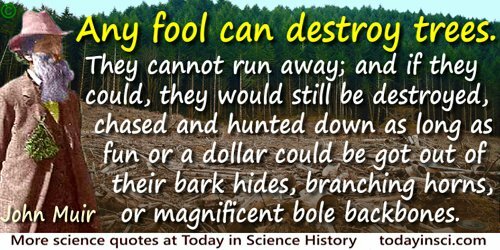 Were its back bone removed, our material civilization would inevitably collapse. Modern thought and belief would have been altogether different, had Mathematics not made the various sciences exact. The Teaching of Mathematics in the Elementary and the Secondary School (1907), 13.